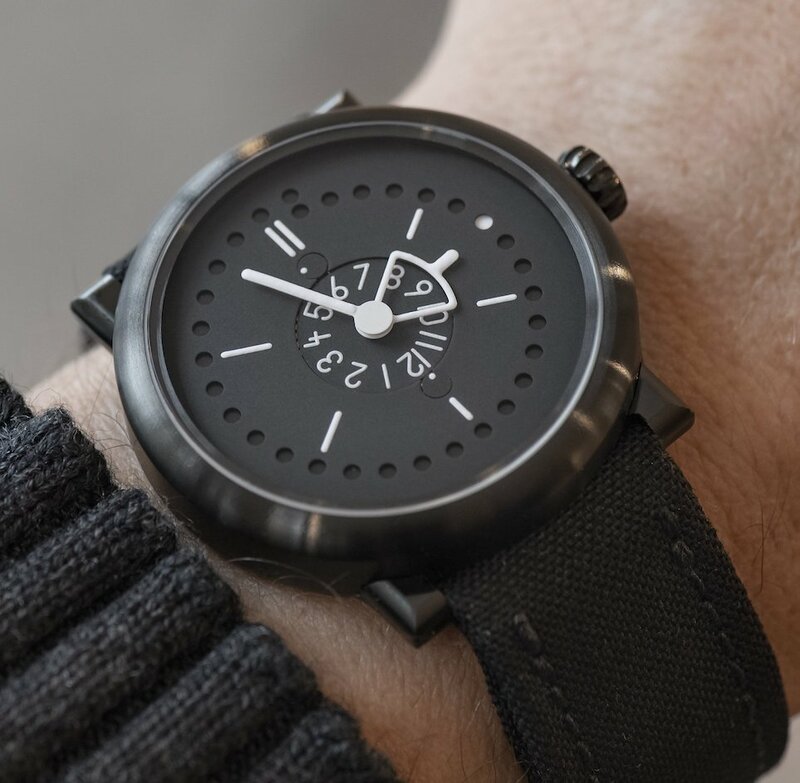 A unique hour hand that shows two timezones at once, and an analog date display that is more readable than a digital one. Dr. Ludwig Oechslin's two timezones + date watch displays two timezones and the date in a functional way. First time zone: The hands display the first timezone. Second timezone: The number inside the open hour hand indicates the second time zone. The timezone disk in the center is adjusted so that the difference between the two time zones is displayed at 12 o'clock. If the second time zone is ahead (for example, +3 hours), you set this number at 12 o'clock. If the second time zone is behind, you subtract from 12, and set the result at 12 o'clock. Both time zones are designed as 12 hour indications. It is assumed that whether the second time zone is ahead or behind the first is known. 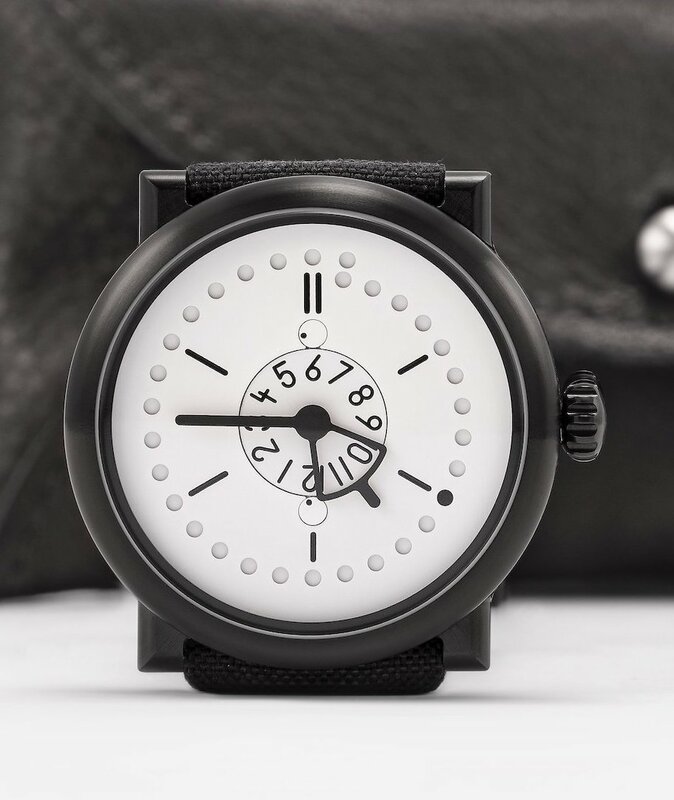 Date: The 30+1 holes around the perimeter of the dial display the date. The 10 minute markers serve as reference points. For example: the marker indicating 30 minutes also shows the 15th day of the month (30÷2=15). These 5 day markers allow for the date to be read at a glance and after a short time, you can recognize the date intuitively. Power reserve: The small circle beneath 12 o'clock is the power reserve indicator. Full power (60 hours) is when the dot is beneath the rightmost 12 o'clock marker. Empty is when the dot is beneath the leftmost 12 o'clock marker. The disk rotates counterclockwise. 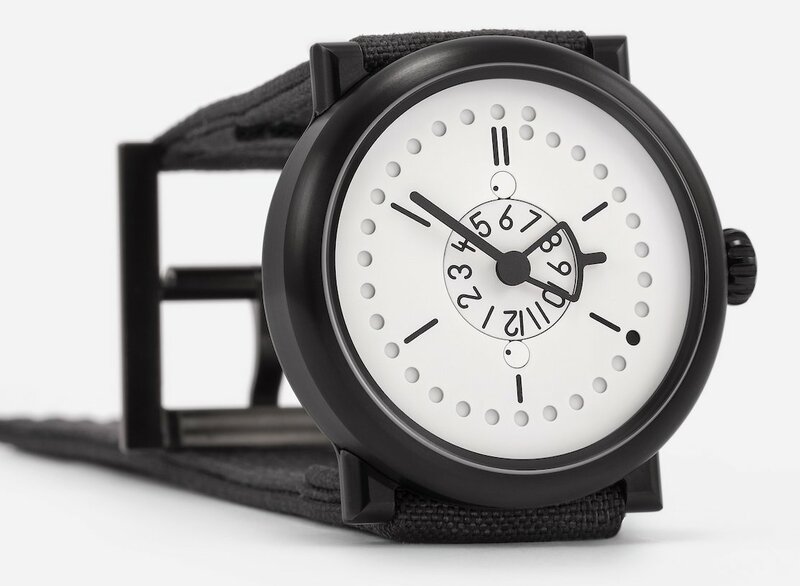 Hour and minutes: The exact minute can be read using the date holes, which are spaced at 2 minute intervals. Holes mark even minutes and gaps odd minutes. 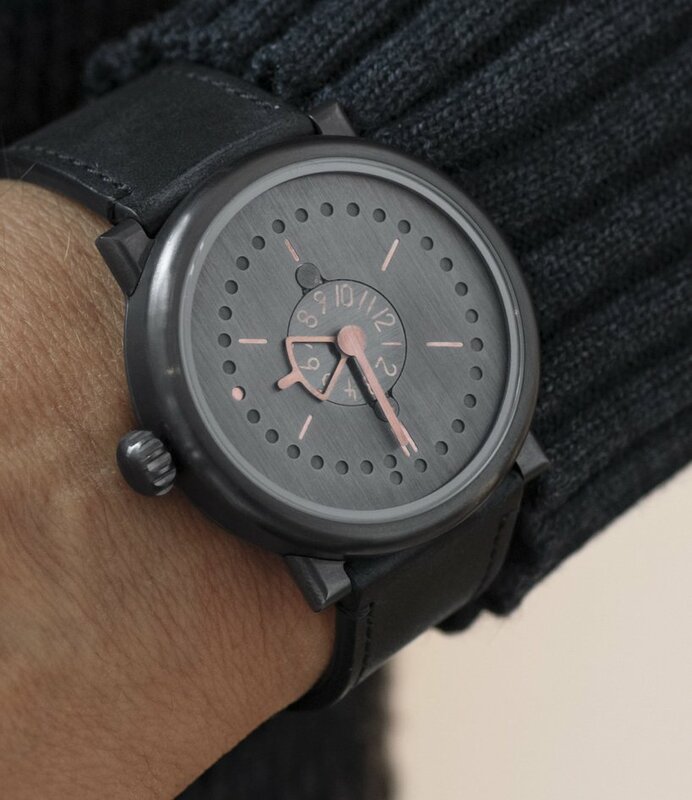 Seconds: Just above the 6 o'clock marker is a seconds disk with a milled excentric dot. This disk shows the watch is running. 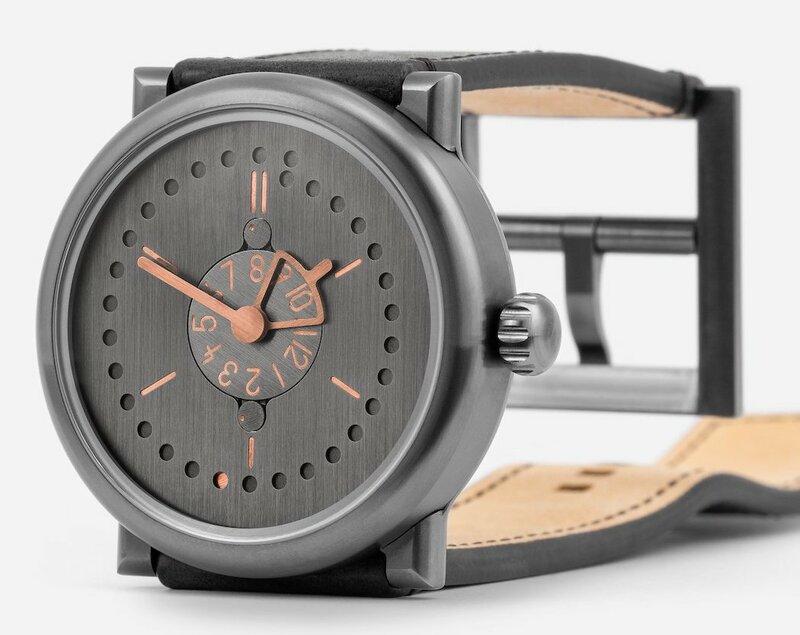 The case, in titanium black or gunmental PVD, or in sterling silver, measures 42mm x 12.5mm. It has an AR-coated sapphire crystal and it is water resistant to 100 meters. Visible machining marks. 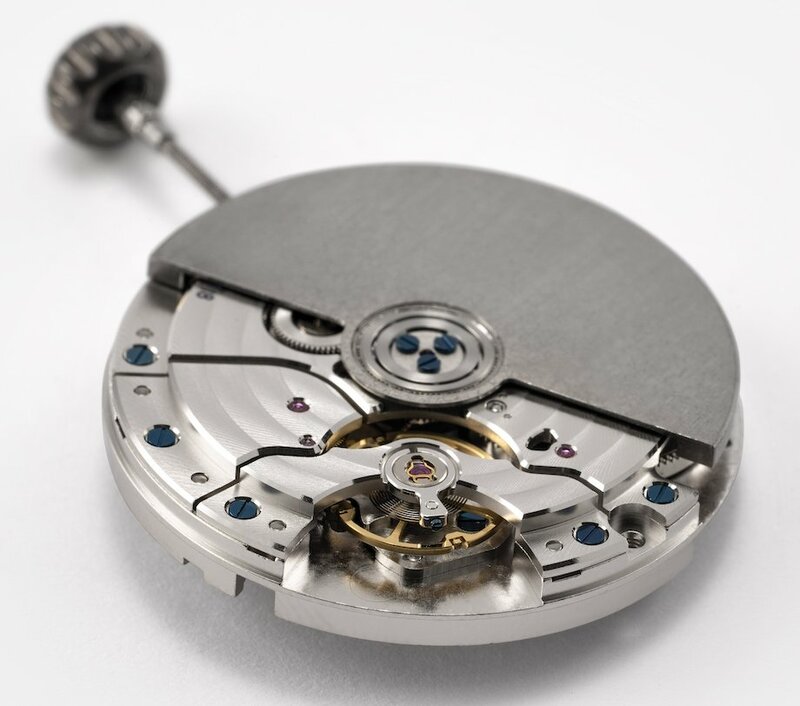 ochs und junior watches require no movement ring due to the extremely small manufacturing tolerances on the case. Movement is the Swiss automatic Ulysse Nardin caliber UN-118 with 50 jewels, 28,800 vph and a power reserve of 60 hours. Hand-regulated by ochs und junior to 0/+5 seconds per day. The white or black dial with rose gold, features SuperLuminova X1. It is available with over 80 possibilities of 22mm straps to inlude sturgeon, textile, leather, suede, or rubber. Matching metal buckle. 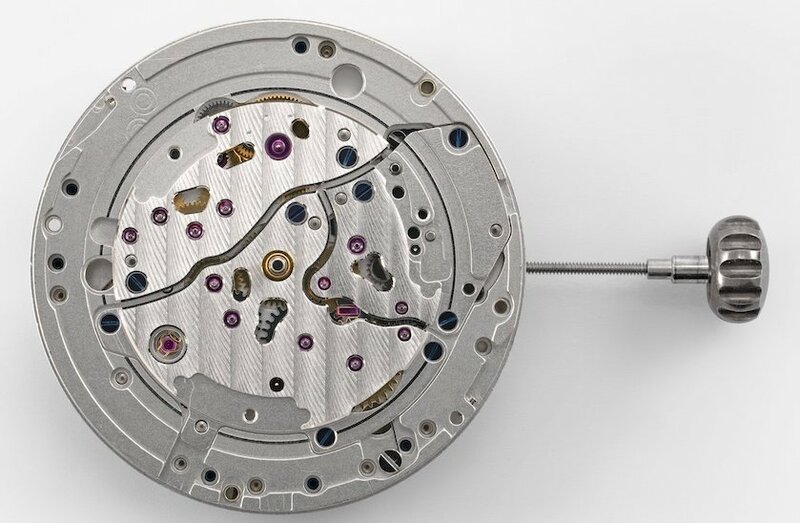 A lifetime warranty covers all parts invented by Ludwig Oechslin, and the entire watch is covered by a 2-year guarantee.